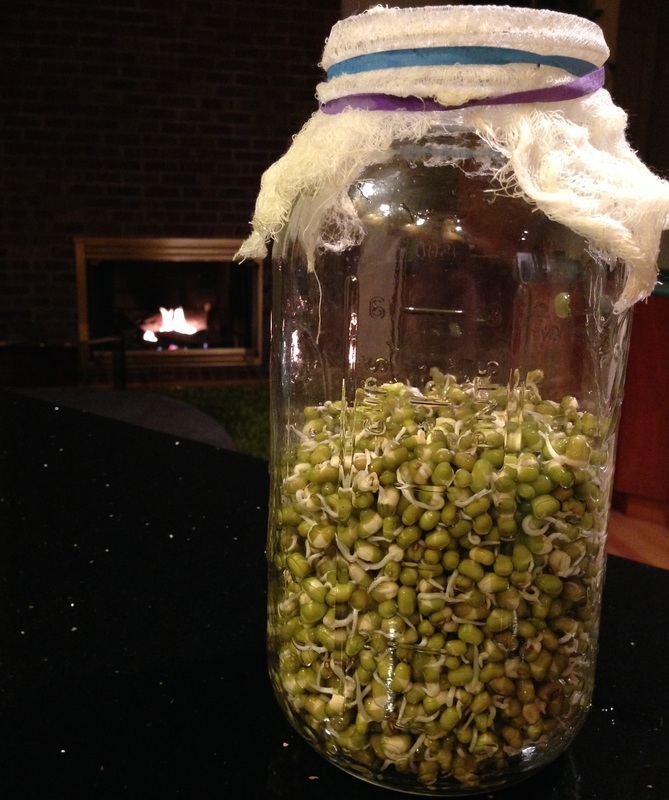 Sprouting beans is an awesome food project. Its easy, cheep and not at all time consuming. Sprouting your beans is also a health-consious thing to do. Once sprouted, the nutrients and proteins in legumes become much more absorbable for the human body. Sprouted beans are easier on the digestive system and more alkaline (as opposed to acidic- a healthy diet consists of mostly alkaline foods) than un-sprouted beans. They're awesome in salads, as a garnish on soups or omelets, in stir frys or in my Veggie Cakes with Soy Sauce-Pineapple Salsa. My one piece of advice is don't make too much! I started with about a cup of dried beans. They doubled in size after soaking. Once they started sprouting they doubled in size yet again. By the 4th day they were almost popping out of a huge (it holds over 8 cups) mason jar I used. Me and my mom ate sprouts with lunch and dinner every day for the next 5 days. I followed the directions to the T and my sprouts sprouted perfectly! I wouldn't change a thing. You can sprout any raw bean, nut or grain. Ideal soaking and sprouting times differ slightly for every type of sprout so click the button bellow (or do a google search for yourself- there's a lot of blog posts with invaluable information about sprouting out there) to find out the perfect times for whatever it is you've decided to sprout.